Whew, folks, Halloween is out of the way and we can all start pinning Thanksgiving recipes and my Christmas decor board can come back to it's burlap, glitter, and pine life. I'm having a celebratory glass of Pinot Noir tonight to acknowledge that fact. It is time for the holidays, for pretty decor, and shopping for gifts, and planning table settings, and wearing cable knit every single day of the week. Clearly, I am ready. Ben and I are spending a quiet Halloween dreaming of the one-day when we'll live somewhere with trick-or-treaters and not just homeless men in mardi gras beads by the front door. So with a silent doorbell and the TV on, we're ushering in November happily. Hope you had a fantastic Halloween! 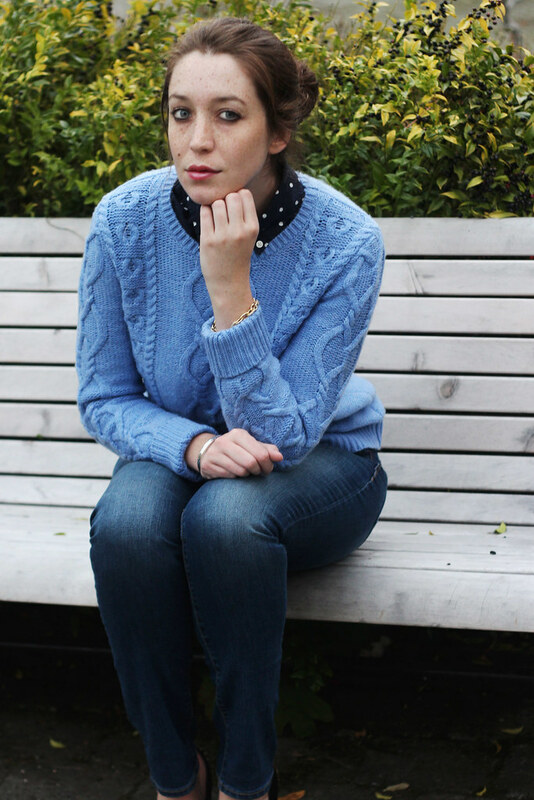 love the cable knit over the polkadot shirt! you look so cozy chic! Whoo-hoo for holiday planning. I'm heading out this weekend and buying some holiday decor at West Elm. Can not wait!! And you look darling. 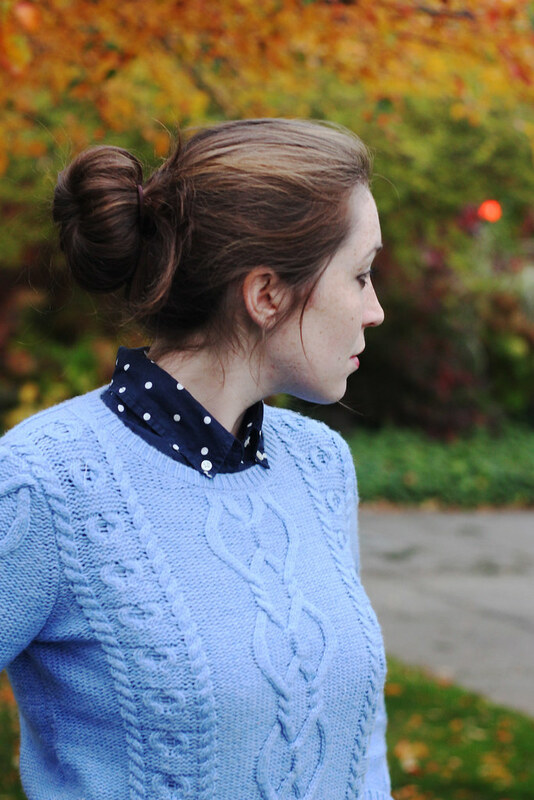 I adore this gorgeous outfit + I'm pretty sure I need a good polka dot shirt in my life!! You look so nice and cozy, I love that sweater. 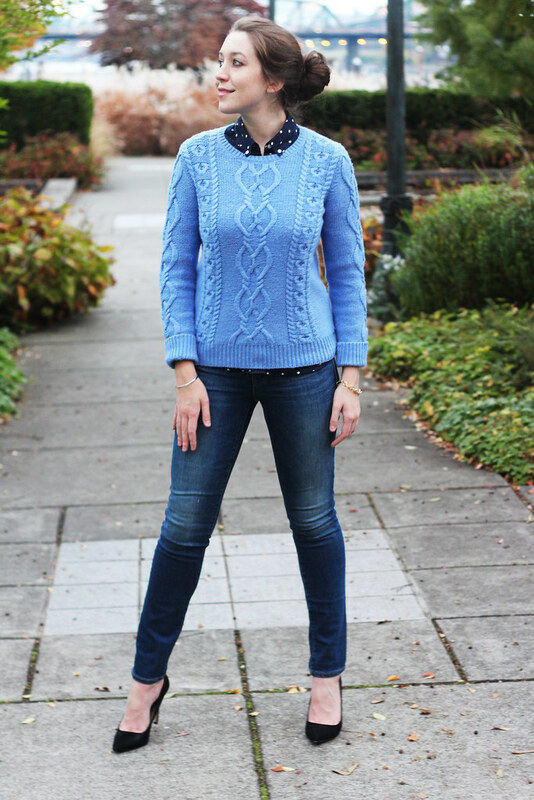 It is perfect for all of this perfect Fall weather we have been having here in PDX! 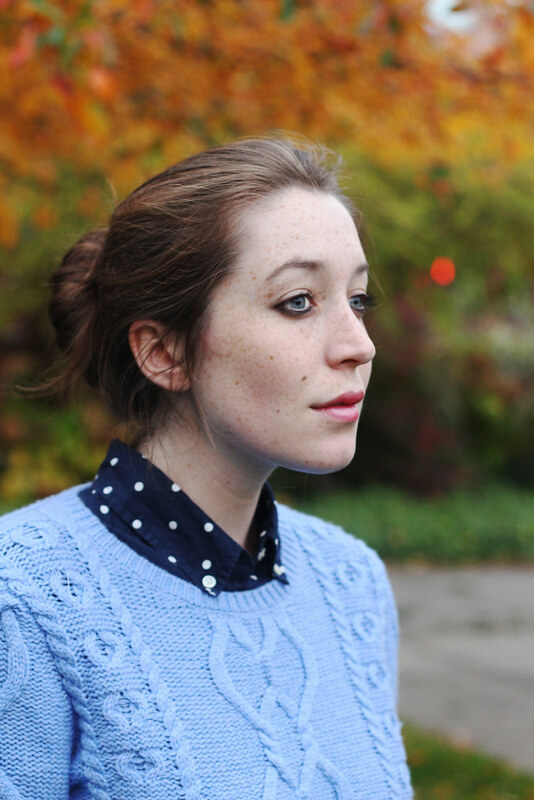 I looove that you layered your sweater with a collared top. My favorite combo! And yes, BRING ON THE HOLIDAYS! Ha, totally agree about October being behind us. I always wait until the last minute to throw together my costume and then get all stressed out and feel behind. Now it's done...full speed for Halloween! Very elegant outfit, btw. 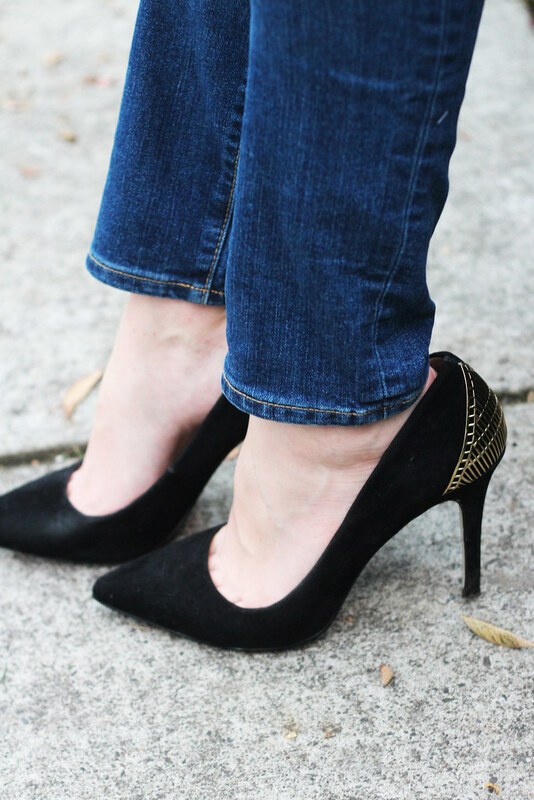 :) Pumps paired with sweaters are always an interesting combo but I like what you've done. I wish it was sunny in Wisconsin right now. You look wonderful and I love the sweater and heels. 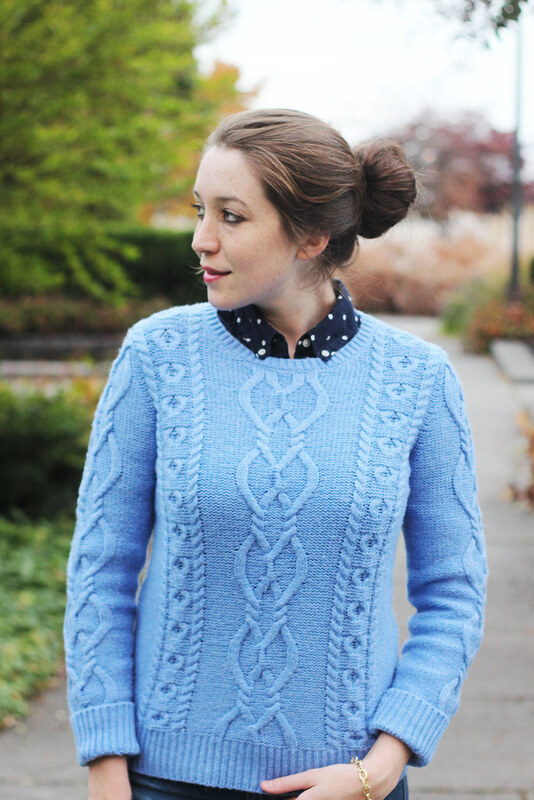 Your sweater and blouse look adorable together! Love it! You look absolutely stunning! so gorgeous, cozy, oh so lovely! You look amazing! 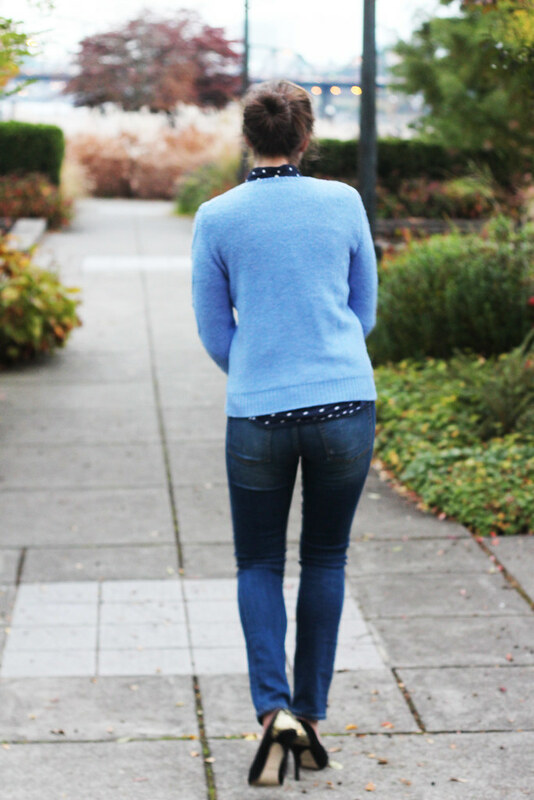 I love how you mixed polka dots and sky blue! Yay for the holiday season - I am SO ready to get my holiday on! Speaking of your post title - my fiancé will only take me back to his home in Oregon during August, I think he is afraid that if I see it at any other time, I won't want to live there one day!